As promised last week - the Ruffled Flower! I used about 5gm (50m/55yds or so) of a cobweb-weight cashmere/silk blend, worked with a 2.75mm (C) hook. I used a 1cm (half inch) diameter spherical pearl button for the centre. The flower came out at 7cm (about 3 inches) diameter. Thicker yarn and hooks will produce bigger flowers. 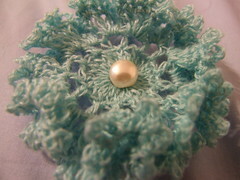 Sew in ends, using the cast-on end to sew a gorgeous bead or button into the centre. Attach to a pin, or sew onto a top, shawl or evening bag. ooooh, a most beautiful and delicate flower too! Well honestly i'm tried of being the one that understands. I'm tired of being here for everybody when they need me and as soon as they see that I need them they disappear. I'm tired of being hurt and forgiving everybody. I'm so sick of having a fake smile for everybody and for once in my life I wanna sit down and cry and feel that it's okay. I hate being the strong person and I hate being nice. I wanna be able to mean and I want people to know that they can't just walk over over me. I wanna be somebody that I'm not. See the link below for more info.